The first Waldorf-Astoria to be built from the ground up since its New York flagship property opened seventy-eight years ago, this luxury resort sits right in the middle of Walt Disney World Resort. 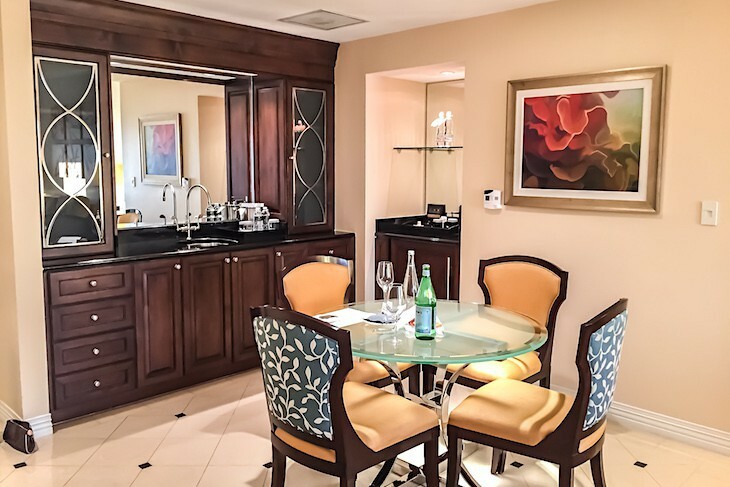 Swank and sophisticated it redefined local luxury in Orlando. Although not technically on Disney property it’s almost nextdoor to Disney’s Hollywood Studios and just a 5-minute drive to Disney Springs. The reasons to love the resort are many: a sophisticated spa, the Rees Jones-designed golf course, two divine pools, seventy-five acres of wetlands…the list goes on. 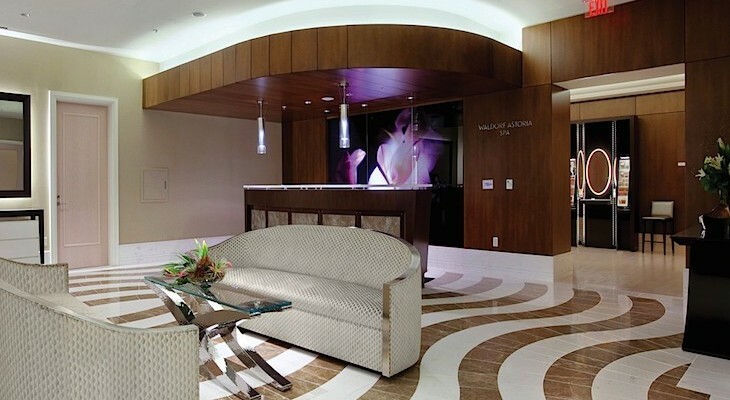 Impressive is the circular, high gloss marble lobby studded with glittering mosaic tile and an aquamarine blue glass reception desk. Its centerpiece is a round velvet settee topped with a handcrafted replica of the New York Waldorf’s signature clock. Old World with a touch of the contemporary, there are dark, rich woods and miles of marble as far as the eye can see. 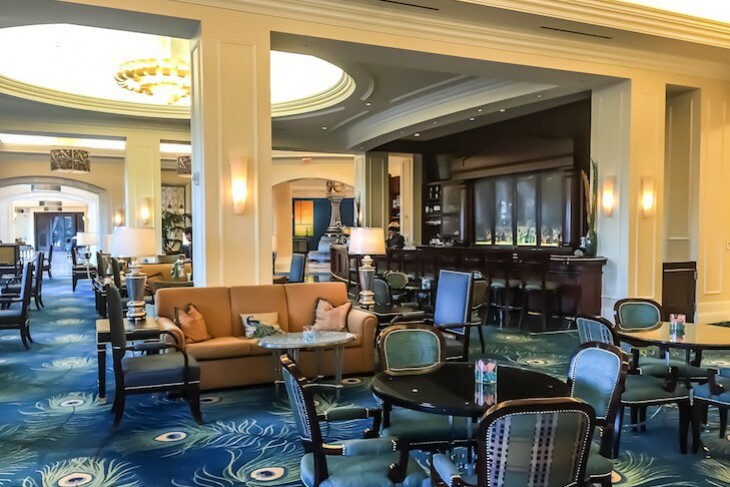 Beginning March 1st, 2019, guests of Waldorf Astoria Orlando will have access to the Disney Extra Magic Hours benefit! Theme Park admission and official voucher received at check-in will be required for each guest. Valid for stays through December 31, 2019. 497 rooms. 14200 Bonnet Creek Resort Lane, Orlando, Florida 32821; (407) 597-5500; Fax (407) 597-5501. 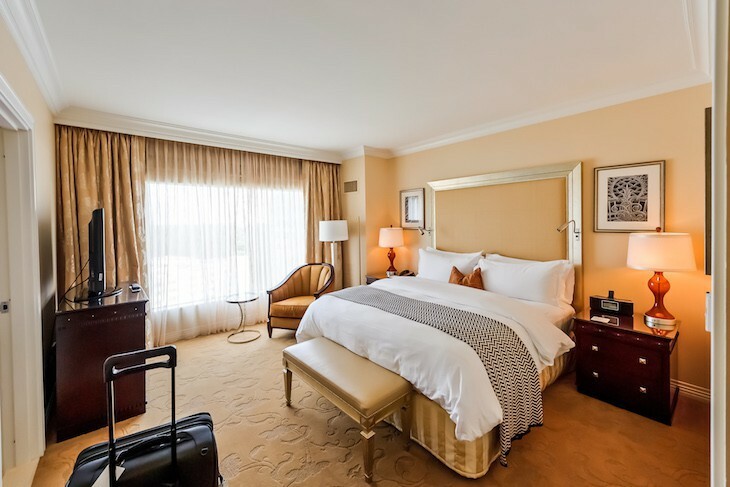 Check-in 3:00 p.m., checkout 11 a.m.
As you would expect at a Waldorf Astoria hotel, guest rooms are stylishly appointed. 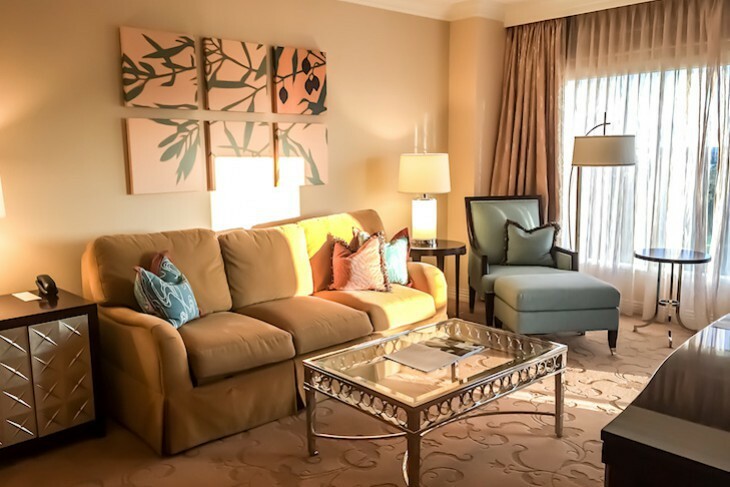 They offer crown molding, maple wood furnishings, 55-inch HD LCD televisions, two-line phones, oversized work desk, glass lamps, heavy silk curtains with shimmery shears, plush muted gold carpeting, and Italian marble entry halls and baths. Beds are made with triple sheeted Egyptian cotton linens, fluffy white down duvets and pillows, feather mattresses, and a black and white hounds tooth throw. 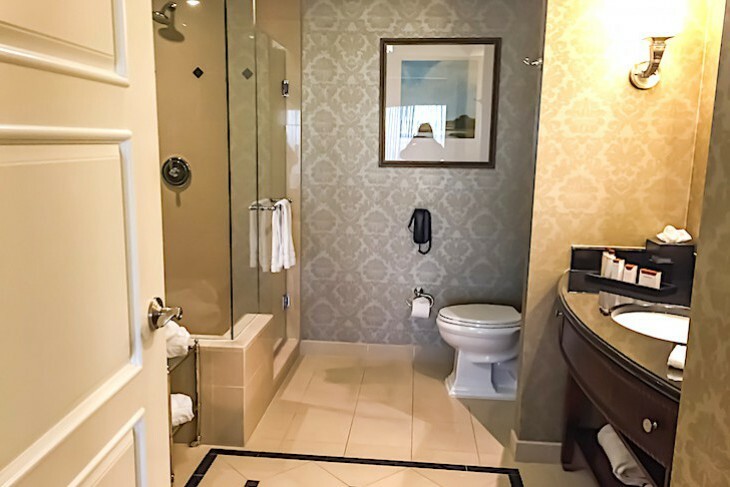 Dual sink vanities can only be found in the top suites, but Deluxe suites and rooms do offer an enormous shower, amber glass tile-fronted soaking tub, Salvatore Ferragamo bath products, and a lighted makeup mirror. A daily $40 resort fee is assessed and includes unlimited internet access, in-room unlimited local and toll free calls, two welcome drinks in Peacock Alley or Aquamarine, access to the Golf Club’s golf putting green including puttert rental, access to the spa and fitness amenities, bike rentals, complimentary gold club rental after 2 p.m., 10% off spa treatments at the Waldorf Astoria Spa, and 10% off pool cabana rentals. 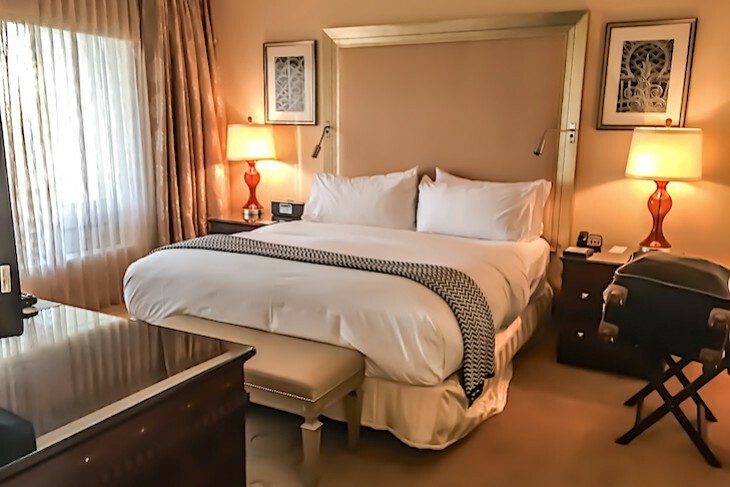 Amenities include twice-daily housekeeping, evening turndown service, robes and slippers, in-room coffee maker, laptop-fit safe, iron and ironing board… in short, a tastefully designed and supremely comfortable room. The hotel does offer balconies but unfortunately only in suites. 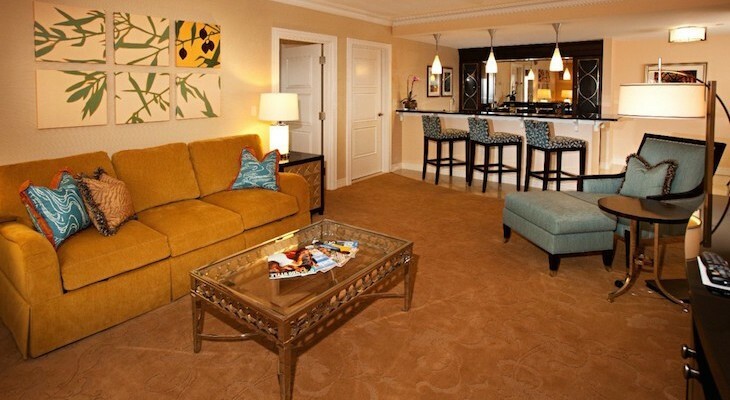 Cara's Tip: Rooms on floor eight or above enjoy an all-encompassing view of the entire area and are on request only. 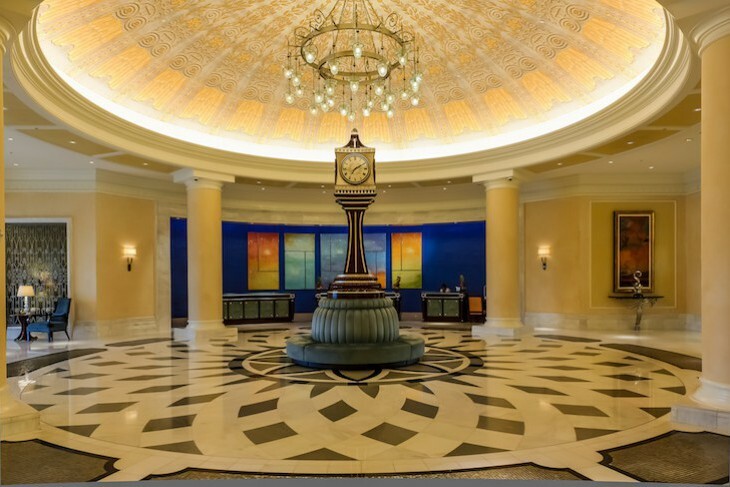 If you are wondering where the listing is for the Waldorf concierge room options, unfortunately there is not a concierge lounge at this resort. Strange but true. 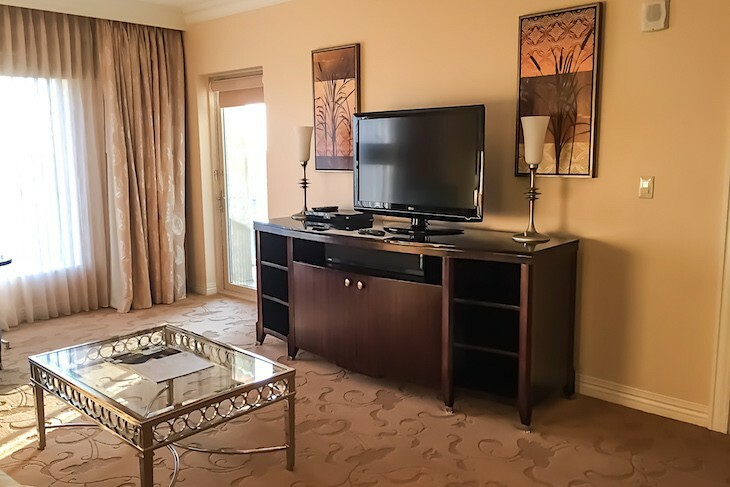 The 945 square feet Deluxe Suites have a separate living area with a four-person dining table, a gold sleeper sofa and sky blue easy chair, a bureau with a large flat-panel TV, and a balcony. 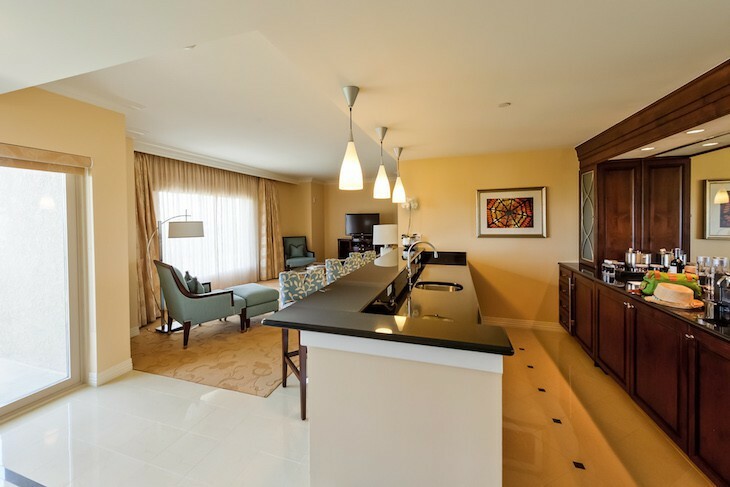 Within the living area is a buffet with wine refrigerator and wet bar. A king bed is found in the master along with a work desk, easy chair, and bureau with flat-panel TV. 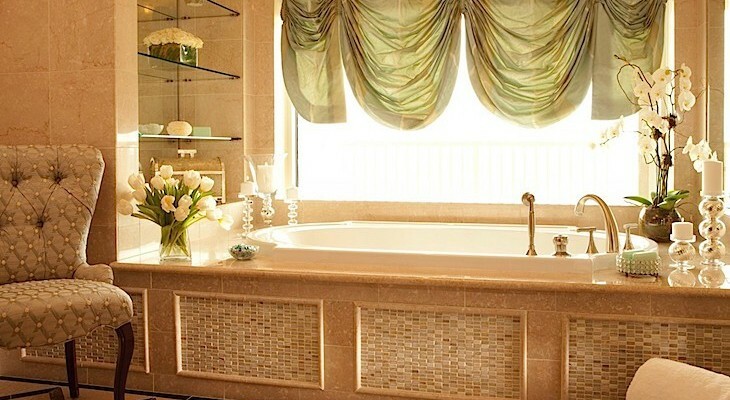 Baths are slightly larger but similar to those in a Deluxe Room. This becomes a 2-bedroom Chairman's Suite with the addition of a Deluxe Room with two queen beds on the other side of the living area. Views are of the resort, golf course, or a distant view of the theme parks. If you’re lucky enough to be ensconced in one of the Luxury Suites you’ll enjoy a 1,460 square foot corner beauty with a large living area, separate bedroom, and master bath. Within the living room is a chenille sleeper sofa, sea blue easy chair and ottoman, amber glass lamps, oversized flat-panel TV, and balcony. There’s also a black granite kitchen of sorts with a counter and three bar stools. While nice it doesn’t seem to serve much of a function since there’s only an under-counter wine refrigerator and sink with loads of unnecessary drawer space. 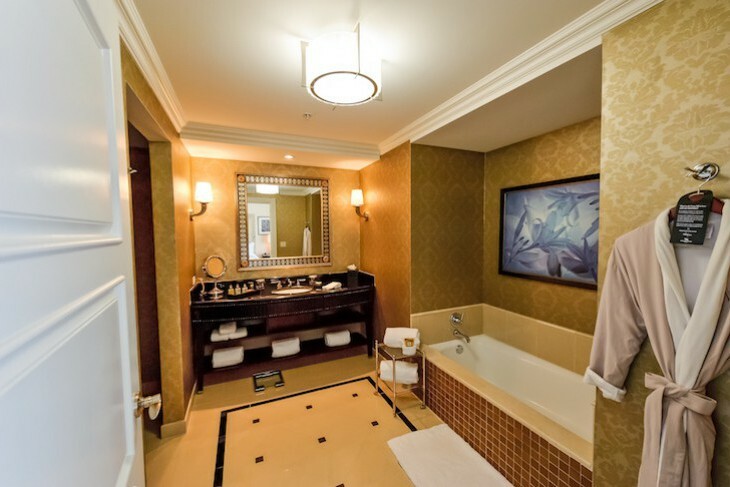 These suites come in oneand two-bedroom options, the second bedroom being a Deluxe Room with two queen beds. Views are always of the front of the resort facing the nature sanctuary, some with additional golf course views. 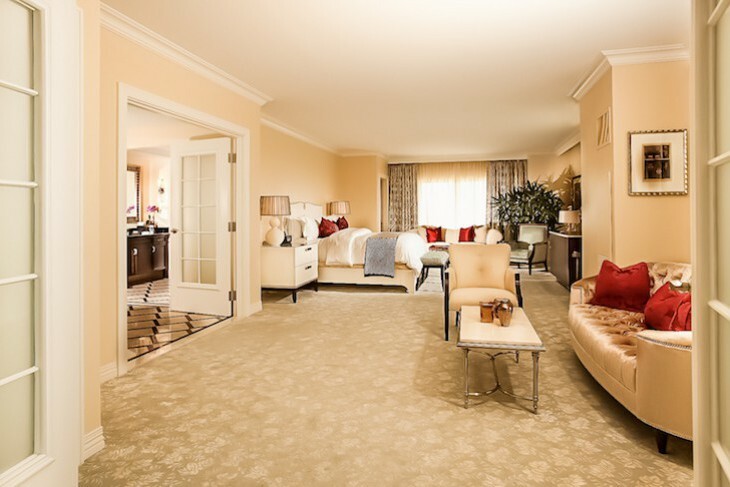 The one-bedroom Waldorf Astoria Suites are always corner suites with 1,780 square feet of space. 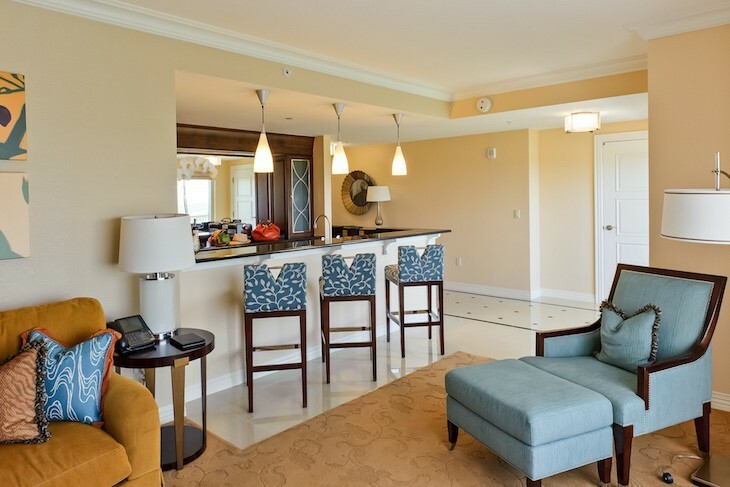 There’s an oversized bar as in the Luxury Suite, but here the living area is longer and narrower with two easy chairs, sleeper sofa, coffee table and TV. 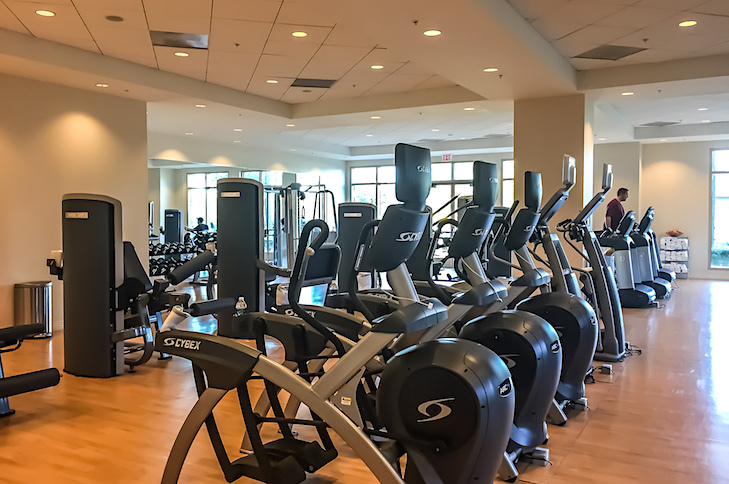 Ask for one on a higher floor and enjoy gorgeous Disney views and spectacular sunsets (oh, yes!). Another plus is a half-bath strangely located off the bedroom entry instead of in the main entry hall, but perfectly okay if only two are using the suite. The bedroom is a standard size and has a king bed, easy chair, desk, bureau, and TV with a full-size bath. The addition of a connecting Deluxe Room off the entry hall makes this a two-bedroom option. 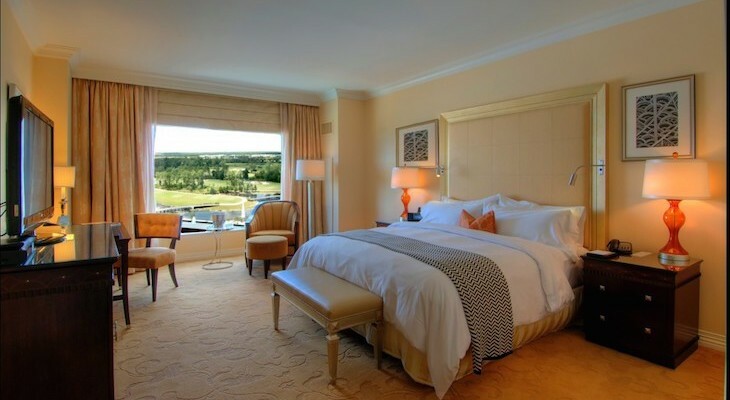 The resort’s two Presidential Suites (one on the 14th floor, the other on the 15th), both offer golf course Bonnet Creek Nature Preserve corner views, three balconies, and 2,852 square feet. The oversized living area has a game table with oversized high back chairs, a ten-person formal dining table graced with double chandeliers, a full kitchen minus a stove, an elegant sitting area with a soft gold velvet sofa, an alcove office, and two terraces. A half-bath with a Venetian mirror is off the living area. From the dining room French doors open into the massive master bedroom with a king bed and its lovely white linen headboard, red and platinum accents, the luxurious gold velvet settee, beige chenille sofa, easy chair, a TV that raises and lowers from a bureau, and another balcony. Baths have two vanities, separate shower, and whirlpool tub with a huge picture window. A second bedroom can be connected. 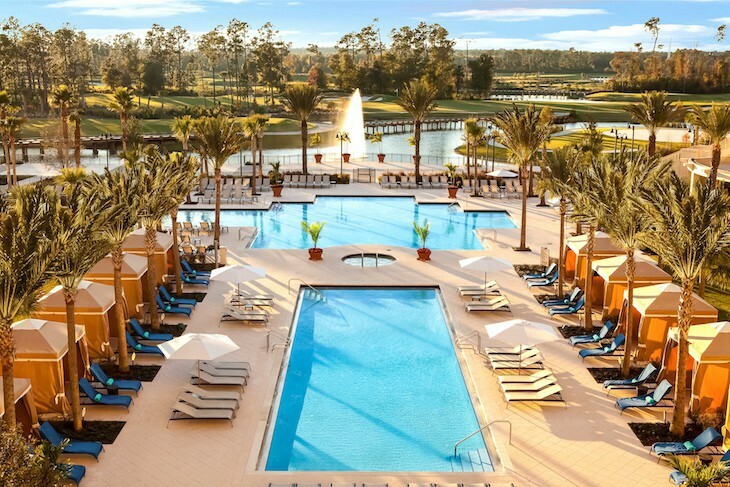 Allow me to connect you to the expert travel advisors at Glass Slipper Concierge to plan your Waldorf Astoria Orlando vacation. Your luxury Travel Advisor and Disney Destinations expert will work with you to create the perfectly planned trip of a lifetime, making sure that nothing is left to chance.